Remember that little dinosaur obsession Eva developed two years ago? Well it's still going strong. It's amazing how much dino info a four year old brain can hold! This past week Eva was pretty sick so we were home bound and getting a little squirrelly. Hours upon hours of pretending to be dinosaurs and playing with dinosaur toys can get monotonous so to shake things up we created a dinosaur museum. The sensory bin became a paleontology dig, filled with various dried beans, rocks and dinosaur skeletons. (I found five different packs of two at the Dollar Store.) Eva carefully digs them out and cleans them off. 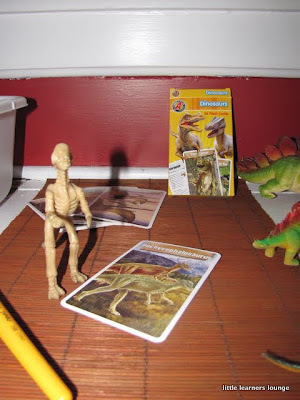 Then she looks through her dinosaur cards (a Target Dollar Spot find a few years ago) and matches the skeleton to its info. We also made a display that allows Eva to sort her toy dinos into groups- Sauropods, Theropods, Stegosaurs, Ornithopods, Ankylosaurs, Ceratopsians and Other Reptiles. She also added some pictures she's drawn lately of dinosaurs. Now every morning, the first thing Eva does upon waking is setting up her museum. Stop on by, she loves giving tours! Your developed things are good and your drawing is nice. my wishes you will be create more and more things with new idea in your life. You selected good baby care products for your creation. This are such cool ideas!!! I have tons of dinosaur skeletons that I got at the MN zoo. I can't wait to try some of your ideas. Thanks for sharing! Actually amazing!Thank you vary much for nice sharing.